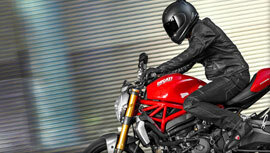 The Ducati Monster 696 is the next generation naked and the final word in urban excitement. 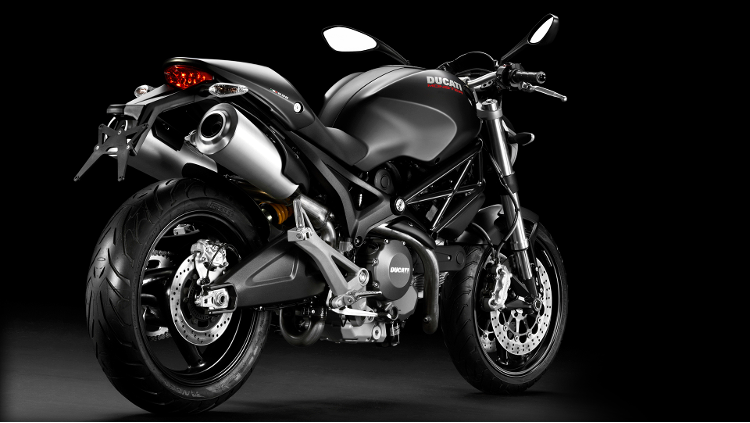 Ride the Monster 696 around your favourite downtown routes in relaxed style or, when the spirit moves you, unleash its dark side to deliver more naked performance than ever before. 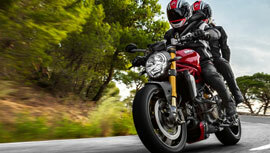 Contact us today to book a test ride and find out our latest special offers on Ducati Monsters..
A comfortable and confidence-inspiring chassis combines with the famously smooth and powerful Ducati L-Twin engine to provide the most enjoyable riding experience. The balance of new technologies expressed in stylishly finished materials is shaped around the original cool Monster heritage. 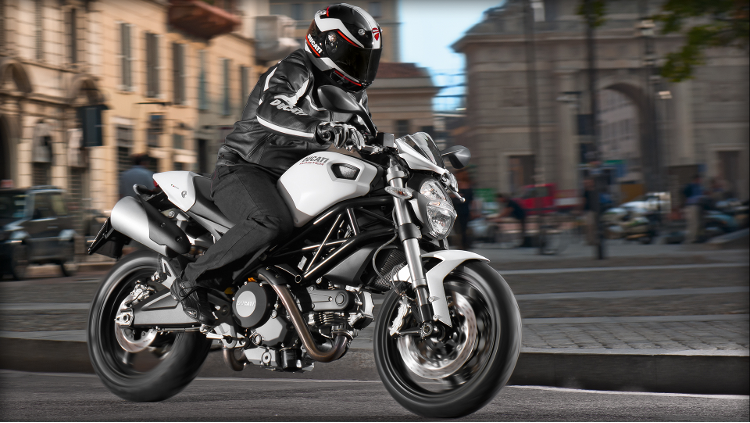 Refined style and design are the clear motivations behind the new Monster. 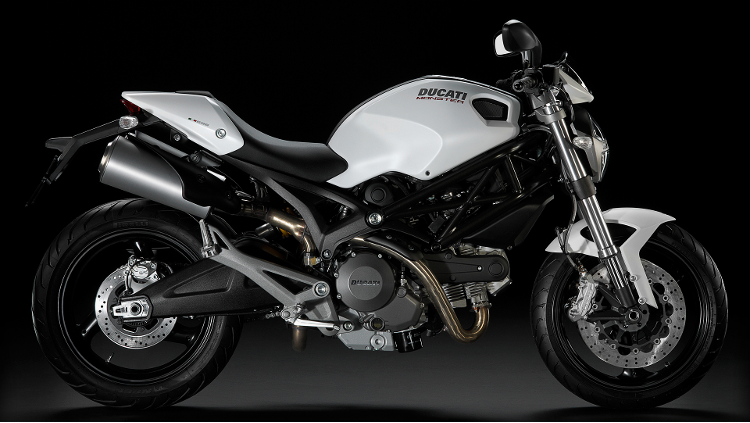 Maintaining its traditional Monster silhouette, the 696 now looks more muscular than ever. Its wide tank tapers to the thin waistline of a comfortable narrow seat ensuring sure-footed confidence when at the traffic lights. The large diameter Hybrid Trellis frame blends stylishly into an aluminium sub-frame and swingarm while minimalist instrumentation and simple controls at the front of the Monster contrast with twin, bold, Ducati-style mufflers at the rear to enhance its urban-ready image. The chassis of the new Monster is made up of a new Hybrid Trellis frame with larger diameter tubes directly inspired by the 2007 World MotoGP title-winning Desmosedici GP7 machine. Attached to this is a rear aluminium sub-frame. 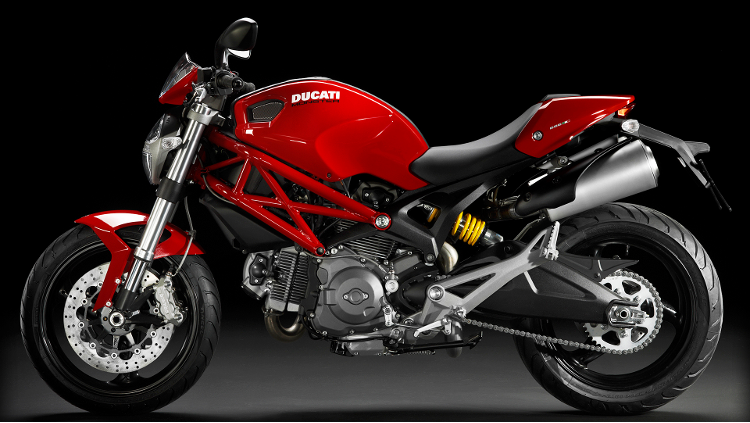 The 696 ergonomics have been improved with subtle but effective changes to the riding position. 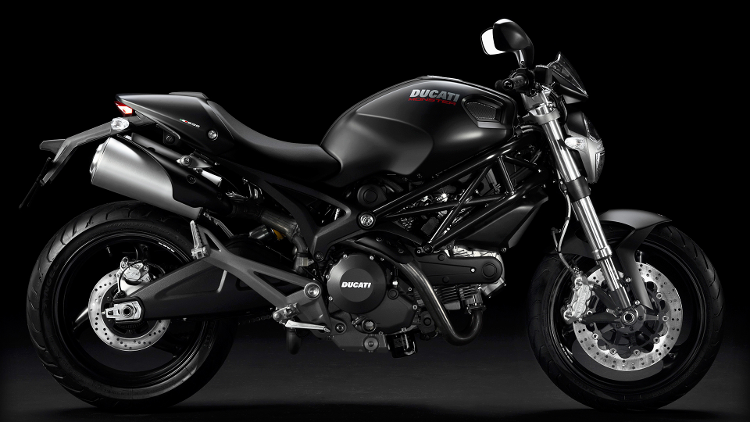 A shorter reach to the bars and a slightly lower, more forward footpeg position, together with the lowest seat height of any Ducati and a reduction in weight, empowers any rider to become the master of this Monster. The front brake system is the envy of its class and becomes the new benchmark for the category with two 320 mm discs and four-piston radial calipers. At the rear, the dual-sided aluminium swingarm draws inspiration from Ducati Corse’s finest racing products in this area. The instrumentation is now totally digital and continues the tradition of all Ducati’s latest-generation hypersport models, guaranteeing lightness, ease of use and a wealth of information. With a fuel tank form created with ingenious removable outer skins that enable quick and easy colour swaps, changing the personality of your Monster has never been easier. The quickly removable rear seat cover makes it even easier to completely colour coordinate and, when removed, reveals a place for your favourite passenger. 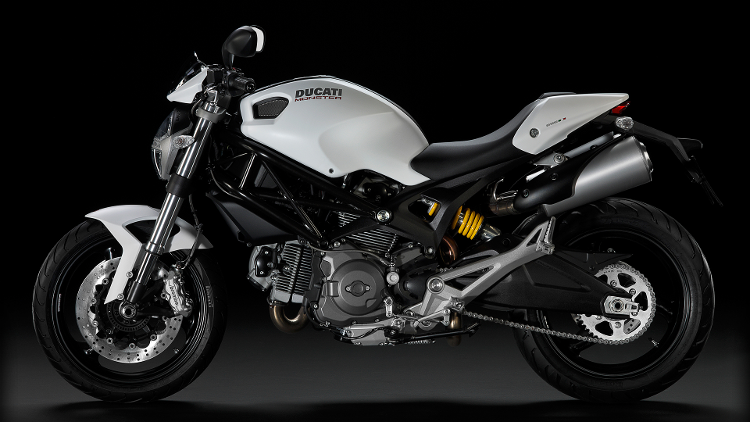 The new exhaust system stands out for its re-routed downpipes that now give the underside of the Monster a cleaner appearance and terminate with twin, bold Ducati-style mufflers. The headlamp unit is characterized by a new triple arc main beam, while the rear light uses modern LED technology. 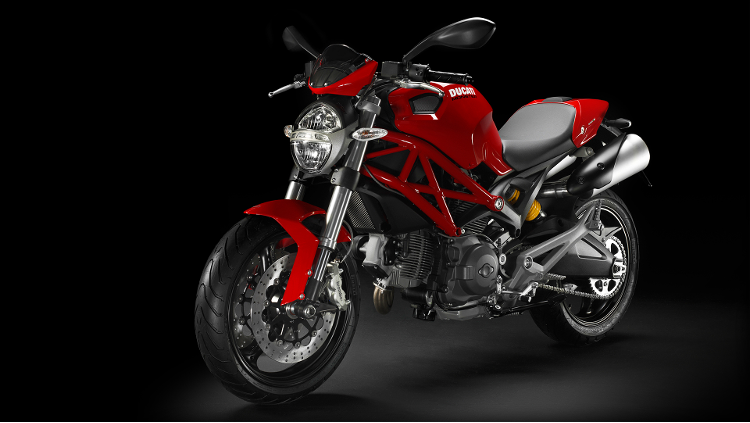 In line with the latest-generation Ducatis, the new Monster 696 has undergone a weight reduction of 7kg from the previous model and now becomes the lightest bike in its category (355 lbs – 161 Kg). 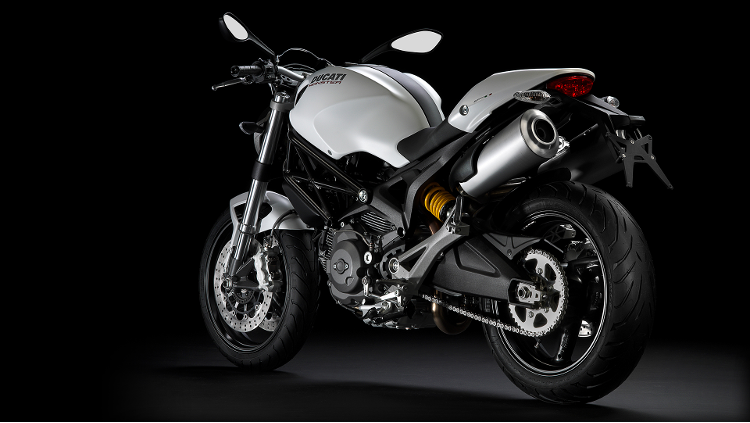 The engine of the new 696 is an evolution of the previous 695 version. 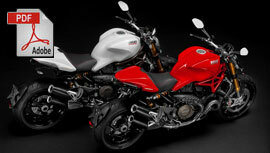 Measuring 696cc, it boasts a series of updates and refinements. Power output gets a 9% boost to 80 hp (59 kW) and an 11% increase in torque to 50.6 lb-ft. This new engine continues to have the best horsepower per litre ratio of all Ducati’s air-cooled units, and it ensures a smooth and powerful delivery for a relaxed but thrilling ride in all conditions. 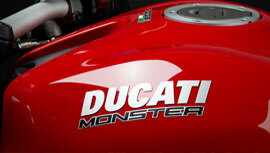 This increase in power has been achieved by the introduction of new cylinder heads, which are now similar to the ones on the 1100 2V engine fitted to the Multistrada and Hypermotard. Bore and stroke remain identical to the previous 695 model at 88 x 57.2 mm, but the pistons and combustion chamber have been revised to optimize the fluid dynamics of the new ports. The camshafts now rotate on bearing surfaces directly in the cylinder head and are supported by means of oil pressure. The elimination of the bearings has enabled the weight of this unit to be reduced considerably and the layout simplified. Furthermore, the cooling fins of the cylinders and the cylinder heads have a new shape, and an improved casting process allows them to be produced closer to one another so as to increase their number and improve thermal exchange. Like its predecessor, the new Monster 696 has an advanced APTC clutch, which makes down-shifting safe and helps keep the clutch lever action light and easy, especially in urban riding where frequent stops require high use.